Come and enjoy SOYA’s 200hr immersion Melaque, Mexico. SOYA’s only 200hr immersion in Mexico. Get inspired with your yoga while you study and practice in the sunny, relaxing culture of real Mexico! SOYA’s curriculum is designed to help you excel at your yoga teacher career and your yoga lifestyle. November 22 – December 8, 2019. Program starts at 12noon on Nov 22nd and ends Dec 8th at 12noon. Join SOYA lead trainer Natasha Scott and Latika (Pierrette Claude) as well as various other local teachers for a truly Mexican experience of a lifetime! 17 FABULOUS days in the quaint village of Melaque, Mexico, immersed in daily yoga practices while enjoying the sun and shade, gardens and the pool. You can’t beat this place for a 200 hour Yoga Teacher Training. Location: We will be living and practicing at the gorgeous Villa Xochipilli, #85 Calle Hidalgo in Melaque, Mexico. There are single and shared accommodations available and fresh, delicious vegetarian lunches served daily. Program Fees: Save $300! Register by Sept 1st and pay $2900. After Sept 1st pay $3200. Fees include the SOYA teacher training manual, text books, supplies, and the Martin Kirk Anatomy online training ($300 US value). A non-refundable deposit of $650 is required at registration. Payment plans are available and can be outlined on the registration form. Students prepare their own breakfasts and can head out to experience the authentic local food for dinners. This village provides a variety of excellent restaurants to enjoy! Offsite: For those of you who wish to stay elsewhere in town, this fee covers your use of facilities at the Villa (pool, washrooms, drinking water, etc) and your daily lunches = $523 CAD per person. Flights: Flights should be booked into Manzanillo (ZLO) as this is the closest airport. Westjet flies direct to Manzanillo from Calgary. Optionally you can also fly to Puerto Vallarta, but be prepared to take a 5 hour bus ride south to Melaque. Be sure you allow enough time for a taxi from the airport to the bus depot. To register please click the “Register Now” button below. Natasha Scott graduated from the SOYA 500 Hour training in 2009 with a specialty in prenatal yoga. Never one to stop learning her enthusiasm to serve others led her to specialize in Yoga for Chronic Pain, certified by Neil Pearson. Natasha teaches a wide range of Hatha Yoga with a strong background in the Sivananda lineage (from her Teacher Mugs). From her super gentle yoga classes to strength in flow yoga, Natasha has a class to suit everyone. She is a Yoga Alliance registered prenatal yoga teacher (RYPT) and Childrens Yoga Teacher (RYCT). She is a Certified Thai Massage Practitioner (Metta in Motion with Mia Blackwell), and a Reiki practitioner. She brings all of these yoga tools to her classes to create a full yogic experience. Natasha is a Lead Trainer for the SOYA YTT Immersions at Sorrento, BC and Melaque, Mexico. Latika Pierrette Claude began her 200 hour studies at Kripalu with Jashoda Edmunds and Brahmani Liebman in 2006. In 2007 she completed the SOYA 300 hour upgrade working one-on-one with Marion (Mugs) McConnell. Latika wanted to deepen her own personal practice and believed the deepest teachings would be in a yoga teacher training. She has found yoga to be a path of discovery that never ceases to amaze and delight her! It wasn’t long before she realized that the best way to share the gifts of yoga is by teaching it to others. Latika has a passion for Yin Yoga, whom she learned from Sarah Powers and Bernie Clark. She has studied Tantra yoga with Rod Stryker and Pandit Rajmani Tigunait at the Himalayan Institute, and Erich Schiffmann’s Freedom Yoga at the SOYA Annual Retreats. 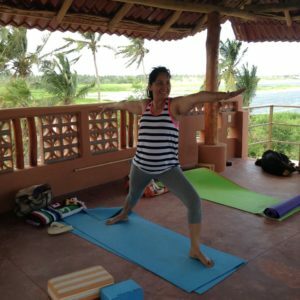 Latika lives full time in Mexico, spending summers in Ajijic and winters in Melaque, where she is the owner of Latika Yoga Studio.